Despite my urging that her receptivity suggests she is probably every playwright’s dream audience and every critics post performance conversational delight (as well as every analyst’s dream analysand), she won’t go near a theater. Given the discomfort with which she experiences the seduction of live performance it was, in retrospect, a good choice on her part to pass on my suggestion she join me for an opening weekend performance of Jessica Goldberg’s “BETTER”, offered through November 16, by The Echo Theater Company in Atwater Village. Because “BETTER” is nothing less than an evenings immersion within the viscous ocean of dreams and memories blended from four generations of the weight and the love, the deception and the truth, that is family. Just as each member of any family is struggling to find his or her own personhood as both an extension of their kith and kin and as a unique being navigating their solitary path through the vagaries of life, the family itself is continually struggling to establish its own identity. Ms. Goldberg understands and conveys all of that in a deceptively comfortable and assured manner. Ostensibly the story of Annie’s (Meredith Bishop in a flawless portrait of love, devotion and obligation, both upstream and down, running headlong into a growing sense of life’s shortness, and of it’s possibly only having the meaning we give it) return home to visit her dying father, Goldberg deftly weaves in the threads of four generations certainties and doubts, needs and offerings. The staging of the play by director Jennifer Chambers is a wonderful bit of work. Essentially taking place within one house, with each room always visible and R. Christopher Stokes lighting functioning as a soft reminder that ‘offstage’ events are also a part of our being and our drama. In ‘BETTER’ it is as if the hard facts and the subtle nuance of the forces that form and move us have become a mobile; contributing weight, if not action, to every thought and conversation; there for the noticing, if we only will. The rooms and their furnishings, the doorways and the porches, the lit areas and the shadows, all function as physical representations of the drama and the comedy in which Annie has been cast. This mobile not only balances memories and feelings, it also counterweights rooms with porches, beds with steps. It is a mobile of archetypes and architecture, delicately balanced, with the added element of the weight and the buoyance of subtle degrees of illumination. That is Annie’s world, which Goldberg has so deftly created, and which Bishop brings us along with her to explore. But if this is a one-act play, it is far from one person’s story. (Johnathan McClain as) Annie’s husband Cal is much more than a one-dimensional prop with the usual flaws against which a searching protagonist differentiates herself. His struggles are at once comedic and sad and Goldberg’s decision to respect his own humanity not only makes him more interesting, they add to the legitimacy of Annie’s crisis. Cal’s scene as a softer, Anthony Robbin’s style huckster isn’t only comedic as McClain shows us the discovery, mid-lecture, of Cal’s realization of his own failure. And again, the talent of Ms. Goldberg’s writing and the beauty of her vision, we sense the sadness of the long distance supplicant – Cal’s implied audience (is it us?) looking to someone else for the explanation of their lives. Similarly, Annie’s father Marty (Joe Spano) is crafted as a complete human being. Wracked by the pain and enfeebled by the unfairness that is the cancer consuming him, Spano reveals not only the weakness of Marty’s present, he also lets us feel the sinewy toughness of the person he was. Somehow, within the eyes that brace themselves against the physical suffering he endures, there is also a delight in his own paternal mischief that we come to learn has not been entirely displaced by his illness. One of the best actors working in any performance medium Spano’s Marty is a tribute to a life dedicated to his craft. Malcom Madera and Andrea Grano as Annie’s high school admirer and his estranged wife, Frank and Missy, bring an important sense of external reality to Annie’s dilemma. They are able to portray a former couple, still interacting as friends and occasional lovers, as something other than caricatures, and in so doing keep the wider theme of the play on track. With their creation Goldberg adds to the dilemma faced by Annie, and the audience’s engagement in her story, by accentuating the reality and the humanity going on around her. Madera and Grano create real lives brushing up against Annie. All choices, even good and wise choices, have consequences. In Frank and Missy Jessica Goldberg has shown us that consequences don’t always require losing everything. With her own story weaving in and out of Annie’s, her mother Laurie, as played by Sigute Miller, deftly reveals the past and present dilemmas of her own life and marriage. She presents, as do Frank and Missy, an optional path and outcome for her daughter. Not in her conversations or her arguments with Annie, but with her own actions and revelations. Miller’s characterization of Laurie’s hurt, then acceptance, then re-examination of Marty’s possible infidelity feels as real and as moving as any conversation you might have had with a family member or friend carrying a wound or a grudge, living a maladapted or at least a re-shaped life over some long past event or loss. As with the rest of the supporting cast Miller offers up in Laurie a real life against which Annie’s own can resonate. The result is that Annie’s thoughts and choices feel true. There is no predetermined outcome waiting to be dropped like confetti at the end of a parade or the opening of the prize winning door. What we know, from Frank and Missy and Laurie is that no matter what Annie chooses there will be loss and there will be growth, there will be sadness and there will be love. Which presents us then with Goldberg’s question for Annie – and for us. With which choice’s resulting sadness can we more easily live? Or perhaps: which choice in life will offer us enough growth and love to offset the loss and sadness it requires? As Anya, Eve Sigall offers up the least concrete of the plays characters but her performance as Annie’s matriarchal namesake leaves a profound mark upon the story. In some ways (perhaps the most interesting discussion is: for BETTER or for worse?) Sigall’s Anya asks us to consider a pivotal question about the culmination, if not the point of life. Is the best we can hope for a gentle slide into a peaceful and loving dream world where the dead and the living speak, listen and share our tears and our laughter? Is a benevolent dementia as good as it gets? Anya’s life is now lived in the places and times that comprise her memory and even her memories are becoming less and less reliable. Except that in her confusion there is also revelation – a bit of mystery and magic that Anya brings to both the play and the resonance of the play that keeps asking to engage us hours and days and even weeks after Sigall’s performance: How many of the living pieces in each of our lives mobiles are interchangeable? Do we create the archetypes we need in the forms of those who enter, or that we draw into, our lives? Do they shape us or have we shaped them? Anya’s ability to navigate the world of memory and the present moment acts as a metaphysical lubricant allowing the audience to experience more than just the moments of Annie’s life taking place on stage. Through Anya’s existential drift, we have a very real sense of those moments that went before, that brought us up to Annie’s perpetual ‘now’; and we also have feeling tones and nuances of the consequences of each of the several choices she has approaching her from her just as perpetual ‘tomorrow’. Somehow Anya’s warmth and love for her ghosts and her living visitors warm us to Annie’s past and future – as imprecise and indeterminate as it might be. Anya shows us a life, and perhaps a life’s denouement, experienced through the filter of love. If this is a play full of oppositional forces and counterbalances, then Annie’s brother John (Jeremy Maxwell) is a perfectly comedic Dionysus to her Apollonian searcher, all the more honest for his lack of insight into himself or the crisis enveloping him. John would probably be an easy role in which to find oneself slipping into parody and it is to Maxwell’s credit and the benefit of the production that while he finds the humor in this character he also plays him with a genuine sense of warmth, loss and loneliness. His interactions with Andrea Grano’s Missy offer a perfectly written and played exploration of unconscious living. There are eight ‘cast parts’ in BETTER – but there is a ninth character (looking for a center/balancing point once again) that is deftly woven into the drama unfolding around Annie, and perhaps to a lesser extent, Cal. Their son Luke is referred to and spoken to ‘offstage’ but never heard or seen. Nonetheless his pull on each of his parents is emotional and visceral. He adds gravity to Annie’s dilemma, as there are ‘downstream’ consequences to her life choices. If the price for her next step in life exacts a price from her and from Cal – so be it. Chances are they will both be better off for her acting with courage and integrity. But what about the innocent Luke? What can be asked of, or more precisely, what can be ripped from him? Luke’s nearly palpable reality, his implied presence, is the perfect complement to the other forces working not only on Annie, but also on every one of the characters in the play. Each of them is a unique life. But they are also forces for lift and drag in each of the other lives surrounding them. 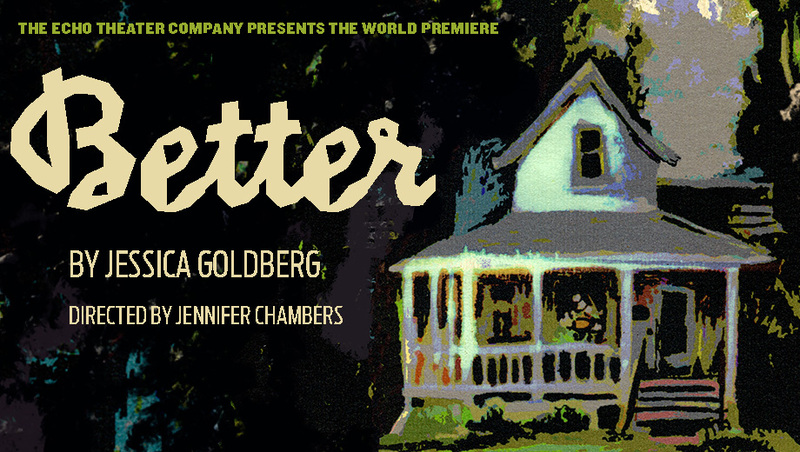 That more than anything else is the brilliance of playwright Jessica Goldberg’s BETTER. This entry was posted in Miscellanious, Theater and tagged Andrea Grano, Better, Echo Theater Company, Eve Sigall, Jennifer Chambers, Jeremy Maxwell, Jessica Goldberg, Joe Spano, Jonathan McClain, Malcom Madera, Meredith Bishop, R Christopher Stokes, Sigute Miller. Bookmark the permalink.